I am so excited to finally write out this recipe. I think it is quite possibly one of my favourite pizzas ever and will possibly become yours too. It is inspired by a Cooking Light Magazine recipe that I found at least 5 years ago. I used to love that magazine and still have stacks of issues that I just can’t part with. Of course I added all of the fats back into every recipe. Some may argue that defeated the purpose others will recognize that’s just good sense. This recipe is not low fat by any means but I would say that compared to other pizzas it is a far cry from the heavy weight contenders you could have. Using a creamy garlic sauce reduces the need for lots of cheese and the toppings add so much flavour that a little goes a long way. I also have butter and olive oil hanging out together. The butter adds flavour while the olive oil lightens it up a bit and adds some healthier fats too. 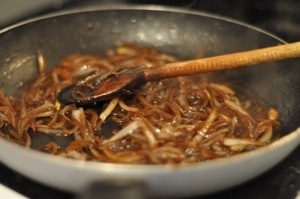 Using Balsamic vinegar helps to sweeten and caramelize the onions quickly. I don’t have time most nights to patiently wait for my onions to slowly cook down so I find this speeds up the process and adds a little extra flavour too. If you are a vegetarian please don’t ignore or overlook this recipe! I made it for a veggie friend and without the bacon it was still amazing. I had considered making the coconut vegetarian version I have seen on Pinterest but got tired and decided it was just fine without it. This recipe makes two pizzas. In a sauté pan over medium heat melt the butter with the olive oil. Add the onions, sugar and the balsamic vinegar and allow the onions to soften. Pour in the stock and continue cooking until the stock has reduced and the onions are soft and caramelized. Season with salt to taste. In a saucepan over medium low heat melt the butter with the olive oil. Whisk in the flour and continue stirring until a thick paste is formed. Warm the milk in the microwave for about 1 min. Slowly pour the warmed milk over the flour and butter constantly whisking. Continue until all of the milk has been added and the mixture is smooth. Thicken the sauce until it is able to coat the back of a spoon. 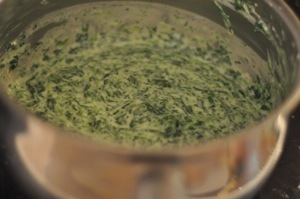 Stir in the nutmeg, spinach and garlic. Cook about another minute and then remove the sauce from heat. Add in the parmesan cheese, stir and season sparingly with salt to taste. Slice the bacon into small pieces. In a pan over medium heat crisp the bacon. Once crisped remove the bacon from the pan and allow to drain on paper towel. 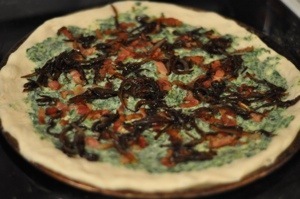 For each Pizza spread one half of the creamy spinach over the crust. 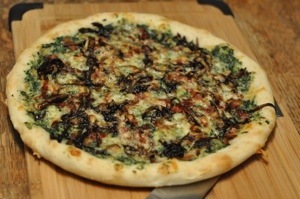 Top with half of the caramelized onions and half of the bacon. Sprinkle one cup of the grated cheese over the top. If you’re like me and don’t have a pizza stone or a wood burning pizza oven, preheat your pizza pan in the oven while the oven heats. When it’s hot sprinkle on just a little cornmeal and then lay out your pizza crust. I find this helps crisp up the crust and prevents a soggy bottom, (very undesirable). I’d love to know what you thought, leave me a comment or just say hi.